A reveal that snuck under our radar overnight but an exciting one none the less. 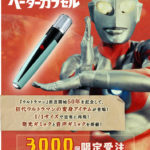 Tamashii.JP has opened orders and posted full official images for the Ultra-Act Ultraman Tiga Sky Type & Power Type 2-Pack! 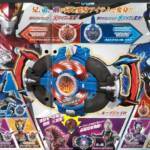 The Tiga Sky & Power Type 2-pack will be released as a Tamashii Web Exclusive set in June 2015 for 9180 yen. Each Tiga not only includes compliments of extra hands but also effect parts to replicate their iconic attacks! 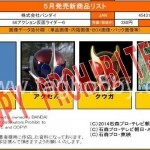 And the set also includes something that’s been absent from the Ultra-Act line since it’s early days, a vehicle! Specifically a new version of Guts Wing 1! Several Web Exclusive middleman websites have already posted up order pages for these figures so be sure to secure your order as soon as you can! 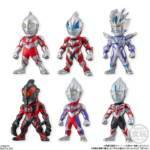 Bandai’s 66Action line of Candy Toys is returning with Wave 6 having been announced for Kamen Rider and Wave 2 of Ultraman. 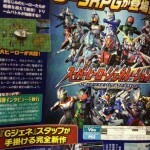 And one more yet to be announced figure, most likely Kamen Rider Black/Black RX or Mach. And again: A fourth unknown figure that will be announced at another date. Both waves will be going on sale May 2015.